50-plus years ago by a World War II Army Air Corps navigator. 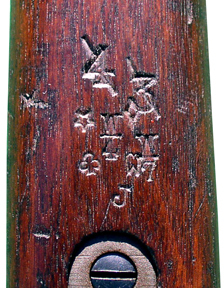 manner of U. S. martial arms. 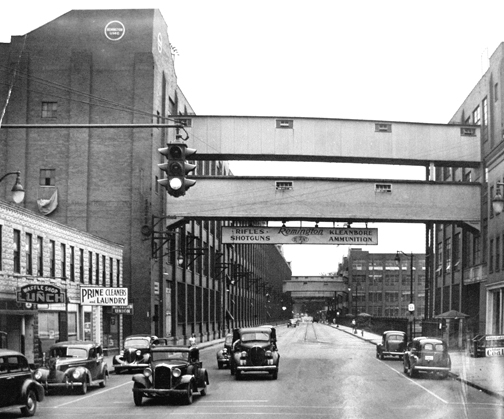 The Remington factory in Illion, New York during World War II. At this time Main Stret ran right through the facility and product had to be transported from one building to another by cross-over bridges. 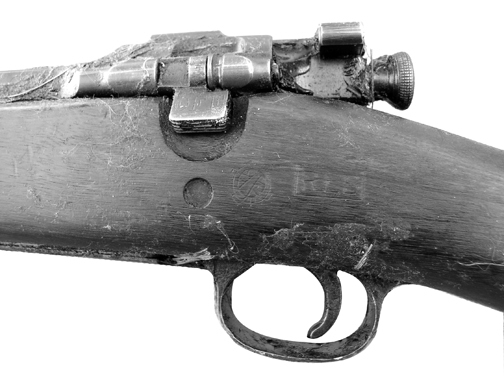 rifles have subsequently provided to scholarly research. its relentless toll taking on mere mortals, the rifles endure. hoax perpetrated for some kind of contrived credibility. growing lot of purest gun cranks wanting to know even more. holding period elapsed in 1955.
primal evidence of factory originality. hopelessly futile trip back into time. arms merchants in the mid-1950s. Unfortunately, surviving rifles are few in number and widely dispersed. friends and acquaintances, particularly in the Southern California region. 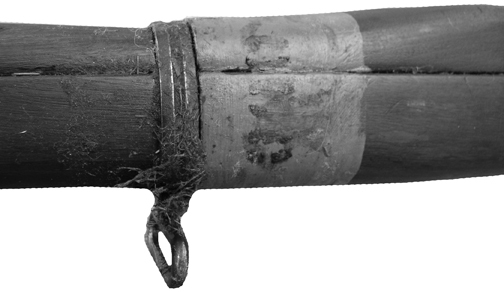 “Class 1 Arms” not firing British Service ammunition. Except for various British ordnance depot markings, this was the only modification made while serving our Allies in England. 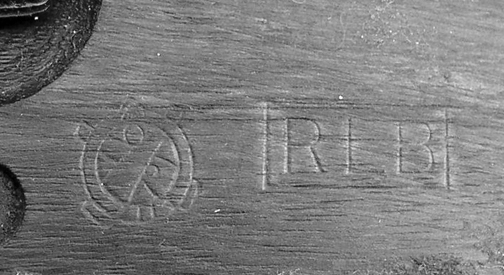 likely among the only remaining evidence of an unaltered factory issued rifle anywhere in existence. conclusion before disappearing forever into private hands. a straw-like packing and grease. alluded, he would never consent to a personal interview for privacy reasons. records; the essence of his life can be revealed. 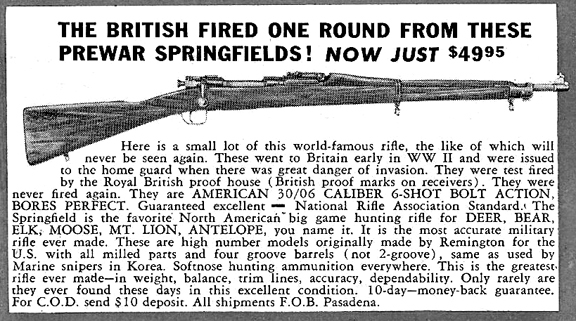 An advertisement in the April 1956 issue of the American Rifleman. 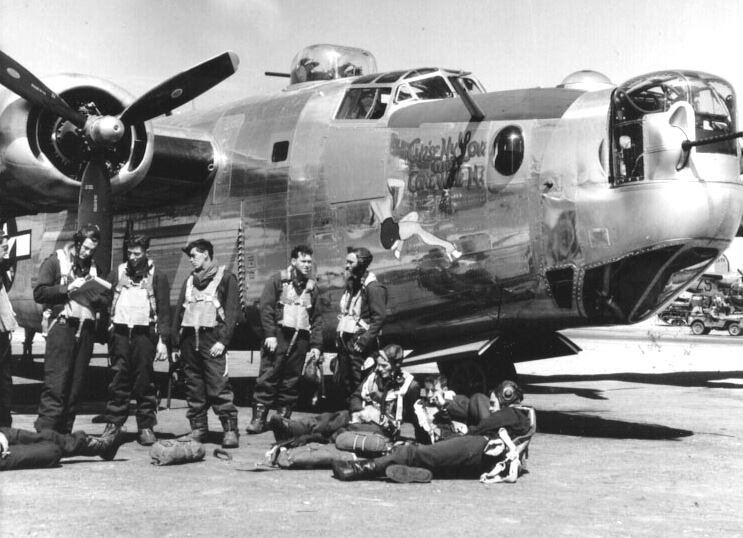 An Army Air Force B-24 Bomber and crew during World War II. 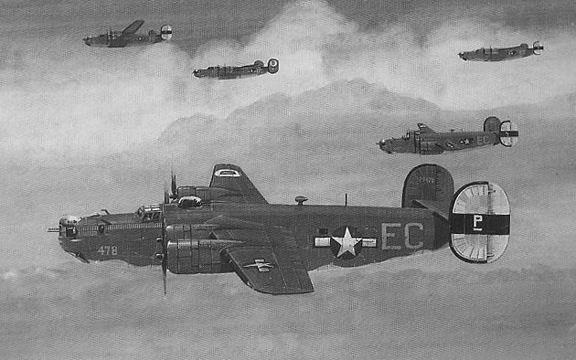 American B-24 “Liberator” Heavy Bombers over Germany. Squadrons during his tour of duty there. 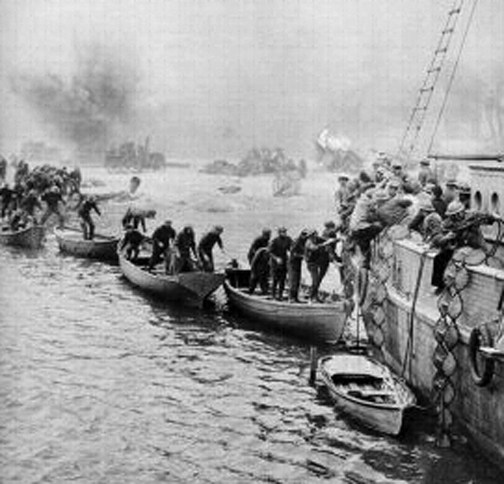 home to the girl of his dreams, he was fortunate enough to make it through this horrendous war without major incident. changed for this aviation warrior. He not only had grown-up, but also progressively realized his strong affection towards Anne. …via a letter, no less. Much to his dismay and good pleasure, she responded almost immediately with an unequivocal …YES! After War’s end and marriage, Anne taught elementary school. 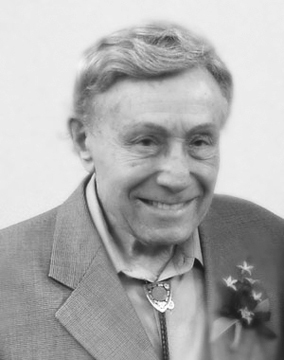 Willard went back to college while remaining in the USAAF. Campaign Medal and the Guided Missile Insignia Medal. In closing this segment, Lt. Col. Willard Levin and his beloved Anne spent the last half of their life in Southern California. rest near his cherished Anne at the Hillside Memorial Park in Culver City, California near Los Angeles. 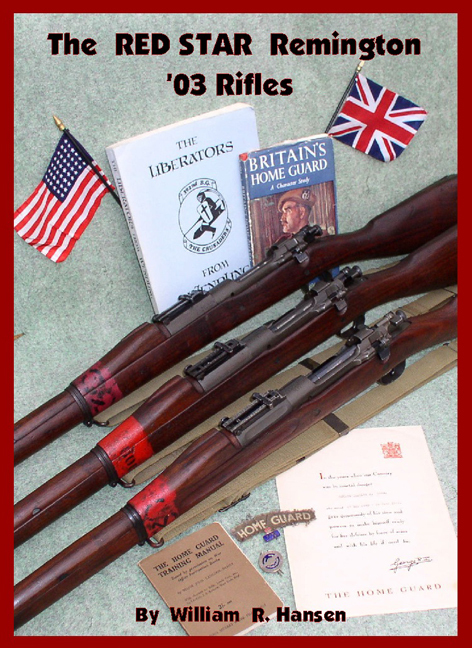 personal use while stationed in England, including the venerable Colt M1911, .45 Cal. automatic. and Anne had settled in Dayton, Ohio at the time. He was still exploring many options for what to do for the rest of his life. translated into a total of 200 rifles. knew where the rifles were warehoused, he wrote a letter back to Jordan on January 10th asking him to contact “…Major G.J. answer, he would proceed with the contractual agreement as presented. 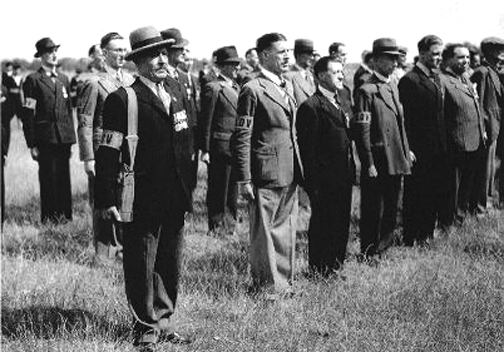 military in many capacities including, “Central Ordnance Depot under the direct control of the War Office”. them would be a lengthy and expensive job”. everything had more or less been arranged. 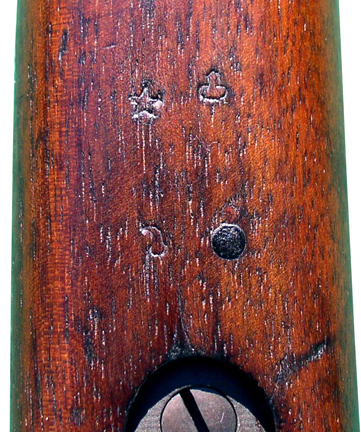 “Red Star” Remington Model 1903 rifles still in protective grease. After carefully considering his options, Capt. Patriotic store front in downtown Ilion during World War II. some of which follows is quite factual while informed speculation must necessarily suffice for the remainder. tested, shot, inspected and placed in their warehouse stores a total of 101 M1903 rifles ready for Ordnance final inspection. with 3706 accepted by Ordnance. So, Remington was finally on its way!! 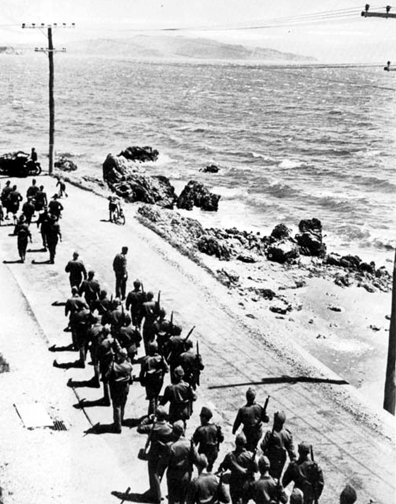 American forces would eventually be immobilized in the Western Hemisphere”. period; therefore, formally included in the RA January 1942 invoice. 3. 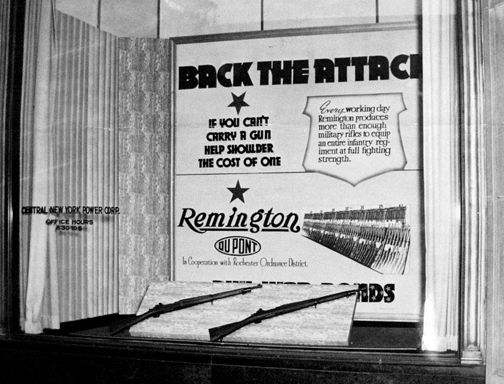 Remington credited itself in the February 1942 shipment accounting for the December 10, 1941 rifle gift to Col. Roy L.
for April 1942. RA credited itself the following month (May 1942). formally included in the June 1942 invoice. 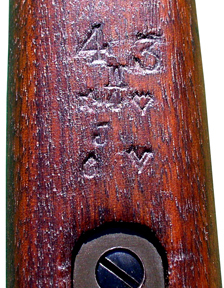 of 10 rifles sent them November 21, 1941 for gauging and drawing update. up as well as how many went to US Forces within the first months of 1942? slings to go with the shipment. between May 26th and June 4th, 1940.
each and destined for the New York Port of Embarkation. be deployed in the region. shipping sent through the Panama Canal. As Table 1 reveals, only 4,521 approved rifles had actually departed Remington’s Ilion, NY plant by the end of January 1942.
convoy bound for Auckland or not. closer to mobilized regular troop centers. (LDV) were in dire need of military weapons of any kind. seems to strongly point to survival of less than one-half of actual manufacture shipped the UK and its Dominions. 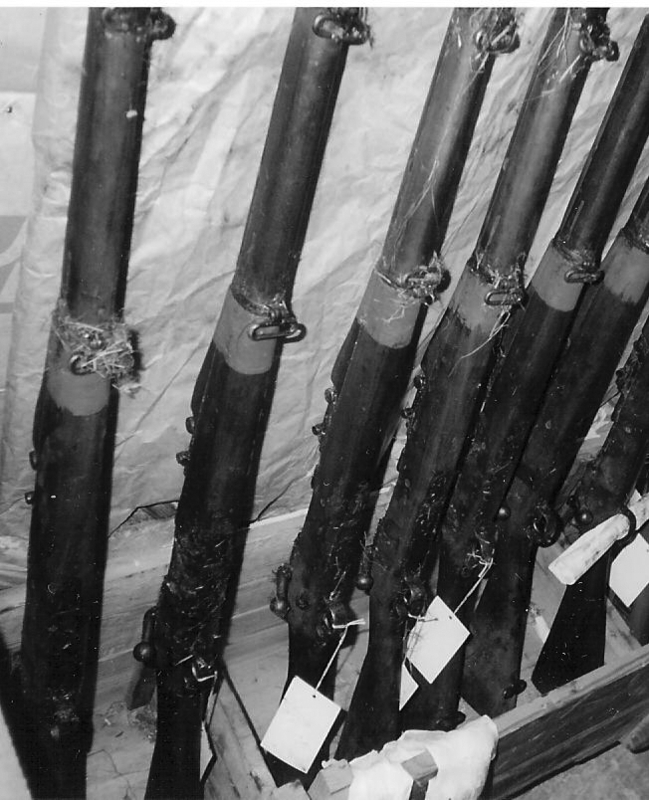 rifles of which 40,000 now had been imported ” ended up in New Zealand by October 1942! 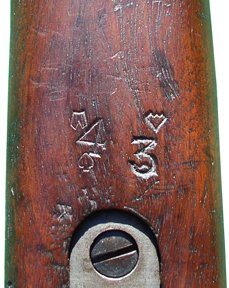 Note: Another report from the Quartermaster General’s Branch states that 42,428 had arrived by 31 March 1944.
the primary WWII duty of the “Red Star” rifles can be specifically traced to the English mainland. for now to hear it second hand from one who was there in 1997-98.
remaining essentially in the same condition-state as when released from the Remington factory 55 years previous. in England in the 1950s. has not yet been conducted since the owner chooses to keep it unaltered. has not escaped such distress. containing a number or letter pursuant to the then forthcoming M1903A3 program. 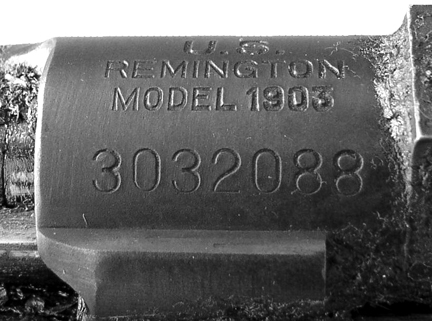 photos clearly show, they were rather indiscriminately placed, often obliterating the Remington factory markings. 3. the various markings did not all originate at the same location, by the same inspector, at the same time or for the same purpose. 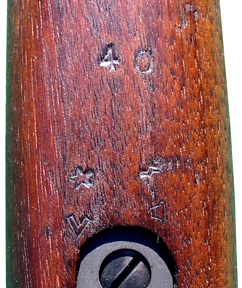 markings at the rear of the trigger guard. Photo No.6 reveals it’s “4 & 3” as also having been “cancelled”. from the ones already having seen the light of a new day. • Los Angeles Times – Obituaries / July 16, 2006; Los Angeles, CA. • “The United States Army in World War II – Statistics (Lend-Lease)” by Theodore E. Whiting, Carrel I. Tod & Anne P.
managed to persist. Some of the latter who come to mind are: Robert A. Sharrock at the Ministry of Defence in England; David J.
Heidi Kuglin of the Archives-New Zealand. 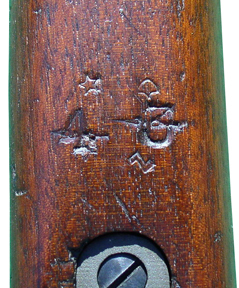 Stock stamping on “Red Star” Remington Model 1903 “Modified” – sn 3032088.